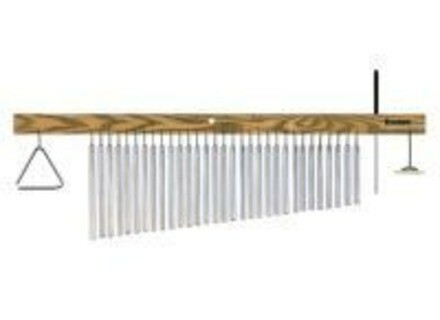 MultiTree, Tubular Bell/Chime from TreeWorks Chimes. TreeWorks Chimes has announced a New MultiTree™ Chime with an extended range of chimes for longer sweeps. Also included is a finger cymbal, triangle and stainless steel beater. The bars are TreeWorks' specific aluminum/titanium blend heat treated to T-6 specifications to produce a brilliant tone and hand-tied with 50lb CordLoc™. The finger cymbal is sand cast bronze and the triangle is high-carbon steel. This instrument combines these three specific sounds to help you save space and increase the diversity of your sound. [Musikmesse] Mapex Black Panther 14x6 Mapex USA has added a Thick Flamed Maple model (BPFM4600THT) to its line-up of Black Panther snares. [NAMM] Pearl VSX and VX series Pearl expands its VX et VSX drumsets series. [NAMM] Pearl new percussion and finishes Pearl has released new percussion with new finishes.